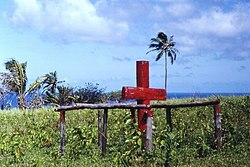 Cargo cult is a name given to several religions. There are many cargo cults in Melanesia and New Guinea. These religions are started when tribal societies come into contact with Western civilisation. When the first contact happened, the tribespeople saw Western manufactured goods, like radios. These things are called cargo. The tribespeople did not know how the manufactured goods worked nor how they were made. They imitate the behaviour they saw the Westerners do, in the hope that some spirits will send them more cargo. In other cases, such as on the island of Tanna in Vanuatu, cult members worship Americans who brought the cargo. During the age of colonialism, the colonial powers came in contact with many technologically less advanced societies. The first cargo cults were documented in New Guinea, and other countries of Micronesia, Melanesia and the West Pacific Ocean. The people who are part of the cargo cults think that the cargo was created by their deities and ancestors. They think that the cargo was made for the members of the cargo cult, but the foreigners have it. For this reason, the efforts and rituals of cargo cults are done so that the foreigners should get less of these goods and the cult members more of them. Vailala Madness - a cargo cult active between 1919 and 1922, possibly the first documented cargo cult. Ghost Dance - a similar movement that happened when Native Americans came in contact with the European settlers. ↑ "Cargo cult lives on in South Pacific, Phil Mercer, BBC News, 17 February 2007". "2006 Smithsonian Magazine article entitled: "In John They Trust."". Air Force Magazine, January 1991, Vol. 74, No. 1. Summary from the guys who fly those Cargoes. This page was last changed on 16 April 2019, at 12:31.